If you think getting into bed every night is nothing less than a fine treat, you are not alone. Many people think the same and love the feel of a freshly made bed. However, you cannot deny the fact that bed making is quite a time-consuming task, and you are only going to make it even more annoying by washing your sheets. But how often should you do it? Keep reading to learn more. Doctors recommend you should be cleaning your bed sheets at least once a week. Waiting more than that will lead to the buildup of oils and sweat on sheets, which will provide bacteria with a feasible environment to grow. You may find insects on your bed that may be attracted towards food crumbs. Skin cells also provide food for dust mites to thrive. This is just a guideline though – you should change bed sheets more often if you have dogs or cat at home or you sweat a lot. In this case, you should consider laundering sheets twice a week. The answer to your question, "How often should you change your sheets?" may also change a bit if you are allergic to dust mites. In this case, you have to clean your sheets more often to avoid having skin cells in bed that attract dust mites. To deal with severe allergies, you may even have to change your sheets daily. You will be better off washing soiled sheets promptly. Similarly, you should wash sheets immediately after incontinence, night sweats, or food stains. Under no circumstances should you be going more than a couple of weeks between sheet changes. If you do not pay attention to this, you may notice your respiratory problems become worse. There may also be dust mite infestations that will make things difficult for you to manage. On the other hand, some people change their sheets only once a month and face no health problems. That is usually true for people who do not have any allergies. 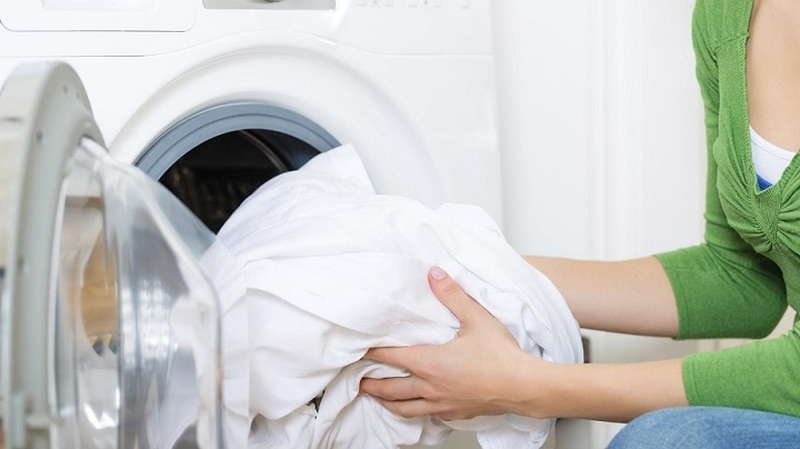 Do not put many sheets in the washer because sheets need lots of room. Ensure that you do not wrap sheets around the agitator or they will wrinkle and tear. Wash sheets separately or with items that are lightweight or with similar color. You can select any temperature if you are washing light-colored or white cotton sheets. You may consider washing your sheets on a hot/warm cycle to sanitize your sheets during the cold and flu season. Be sure to use cool water though to prevent fading of darker colored sheets. When dealing with small stains, you can consider pre-treating stains. However, when you want to whiten dingy sheets or have larger stains to deal with, you will be better off using color-safe bleach. Always follow your machine manufacturer's guidelines when using a detergent dispenser. Check if your machine's dispenser works with liquid detergent or requires power detergent. Add the detergent to the washer drum if your machine is without a dispenser. Check the care label before choosing the dryer temperature setting. Avoid high drying temperatures or you will be left with wrinkling. This may also lead to over-drying and shrinking that damage fibers. Drying at "damp alert" setting will prevent these issues and give you the chance to untangle sheets. Consider adding rubber dryer balls while trying to ensure sheets dry evenly. You may also consider drying your bed sheets outdoor if you want to go green. Now, you have information about how to wash your sheets and how often should you change your sheets. So, keep above-mentioned points in mind and wash your sheets in the best way possible.